Great advice at any age. But if you start doling it out to your children when they are young, they just may remember to do it! 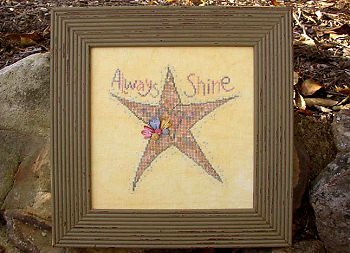 Always Shine is stitched on Zweigart 28 count Antique Yellow linen using Crescent Colours Barrel Cactus, Cheryl Chic, Khaki Mocha, Petite Maison and Wild Oats with JABC pack 8061. East Side Mouldings frame OHPG 8" x 8".